Pottery making is considered traditional art in the Philippines so once you know a place where there’s huge factory of earthenware it is definitely a tourist destination to visit. One example of it is the Camarin in Brgy. Pagburnayan, Vigan Ilocos Sur. Locally, pottery making in Vigan is called burnay making and there are only three camarin (factories) in the Philippines which are all in this side of the province. Apart from of rarity; everyone should also take the chance to learn pottery making because it’s fun activity, full of art and a good business opportunity. Burnay making is not easy as other type of pottery making because the long process to make it durable earthenware. First burnay makers shape their special clays while their potter’s wheel is spinning. It takes energy to spin, they usually hold in a robe to spurt much force or there’s other person who will do the spinning, but it takes a lot of concentration to form an artistic and perfect shape out of the clays. Apart from slowly forming the terracotta, a potter occasionally wets their hands of ample water. 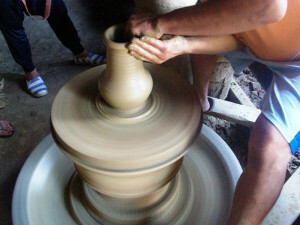 Too much water in hand can affect the quality of pottery making. Of course, shaping and drying of earthenware depends on its size. It takes days before an earthen jar to dry up before cooking in a kiln. 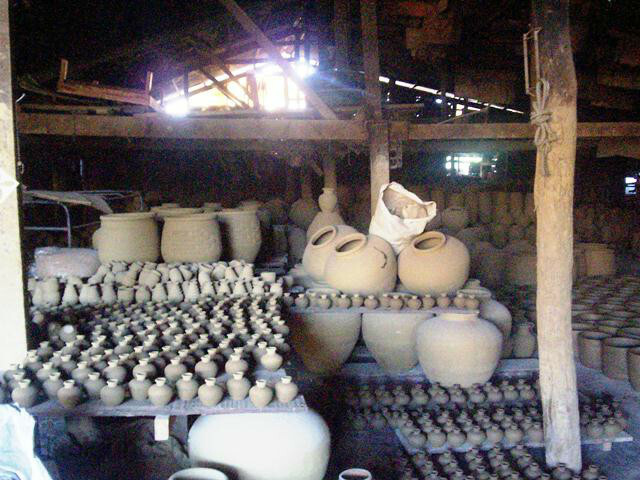 Think of the weather also, rainy season hinders to fasten the drying process of earthenware. Nowadays, terracotta products such as jar (banga) and pot (palayok) are favourite kitchen centrepiece especially for the oldies. It is said water in banga is colder and rice cooked in palayok is tastier. It is because Earthenware has an ability to adjust in any temperature and it is best baking, braising and stewing. Earthenware jar is also among the favourite displays not only in houses but also in restaurants. This ware is an additional attraction and at the same time, inventive organizers and containers. In Vigan earthenware are the best basin for sugarcane vinegar, bagoong (fish sauce) and province’s wine Basi. Another popular spot in Ilocos Sur, Hidden Garden and Lilong and Lilang Coffee shop takes pride earthenware of their place. Customers will not only see their beautiful garden, landscape and relaxing restaurant but also see artistic earthenware around. They also offer different kinds of it from small lamps, to flower pots to big earthen jar that have export quality. With the information above, it is clear that products of burnay making or pottery are not just a work of art. It has wide market from art enthusiasts, commercial establishments, and home makers to foreign nationals who appreciate its quality. Isn’t good also to have pottery making class in your garden? Everyone is learning this traditional art and at the same time giving other opportunity for burnay makers or potters to broaden their horizon.